News behemoth CNN caught a lot of people unexpectedly when it cancelled its Snapchat news show after just four months in December. However, its rival NBC News says that they are very happy with the traction that they’re seeing. 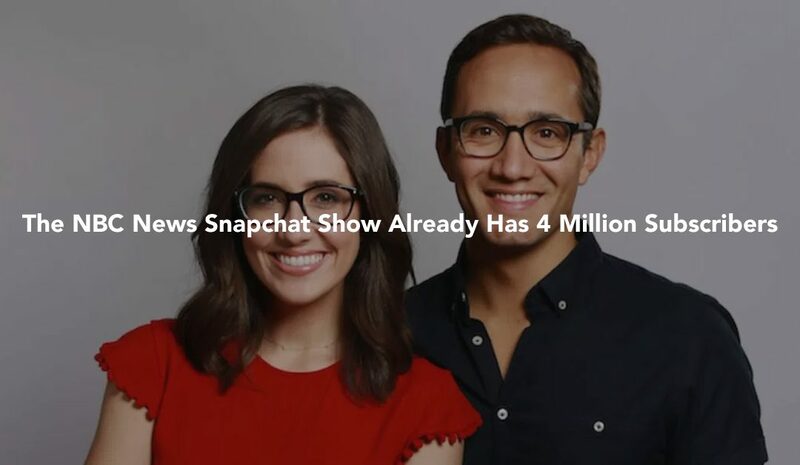 NBC’s show has been on Snapchat for just 5 months and already has over 4 million subscribers. The NBC title called “Stay Tuned,” airs twice daily on the weekdays and once per day on the weekends. Because the show has so many subscribers, it’s counting million of unique viewers watching each month. In fact, in the shows first month, “Stay Tuned” attracted 29 million unique viewers. It now appears that these 29 million viewers are beginning to turn into a loyal following. What’s even perhaps more notable is that more than two-thirds of the “Stay Tuned” audience is under the age of 25. Another interesting stat is that more than half of the entire “Stay Tuned” audience is watching three or more episodes per week, according to NBC News. Each episode of “Stay Tuned” is about two minutes in length, features four different topics, and transitions between both studio and field content. The type of content that is usually found in the NBC News show is U.S. and world news, pop culture, politics, and weather. The investment that NBC News is making on the “Stay Tuned” show is nothing to laugh at. Executive producer Andrew Springer leads a crew of 30 full-time writers, editors, producers, and graphic designers. The entire team is focused fully on the Snapchat show, which is hosted by correspondents Gadi Schwartz and Savannah Sellers. The NBC News show seems to be gaining continued steam, but NBC News wouldn’t comment on whether or not its profitable for them. The success of this likely means that it wouldn’t be surprising if we see Snap and NBC continue to grow their relationship. NBCUniversal, owner of NBC News, is in a particularly unique position to try to help Snap’s content grow and flourish. They invested $500 million into Snap during the company’s IPO in March 2017. Additionally, a few months ago NBCU formed a joint studio venture with Snap that will develop scripted shows specifically for Snapchat.